In any thrift store, accordion records from before the crash can be found for under a dollar a piece — but having been passed over for upwards of 50 years, they may be all scratched up and besides, who still has a working record player? On the knick-knack shelves there you can also find as many porcelain sculptures as you can stomach of cherubic toddlers and elegant angels operating concertinas — cute on the surface until you consider the horrific crash of the squeezebox factory’s delivery van and the train of holidaying vacationers that populated the afterlife with so many buttonboxes. We can only endorse the fabulous Accordion Babes Album / Pin-Up Calendar so many years in a row (actually, all of them) and we remain on the edge of our seats for the next design out of our friends at Squeeze Me Accordion Apparel (where there are some smart holiday discounts available! We also know of one other eminently worthy source of accordionic garment remainders.) But online remains a promising avenue for presents for the hard-to-shop-for squeezebox connoisseur, as Googling can yield instant dividends and save you fruitless and dusty hours of scouring store shelves. Of course on eBay you can find accordion repair equipment and backstraps for sale — a cool, practical present — and actual accordions are all over Craigslist. But there does come a time when every accordionist has to call their collection complete… or open a museum. And the iPod’s accordion apps are nifty, but can hardly be wrapped up and put under the tree. In any case, for the purposes of this investigation, I have limited my search to the internet’s pre-eminent forum of the crafty and stylish sale of the homemade and vintage: Etsy! There you can find thoughtful and creative items and potential gifts the likes of which even your accordionist with everything won’t have seen before. They feature offerings to fit any price range, and the goods you’ll find for sale there, like accordion players, run the complete gamut from slickly professional to awkwardly charming! To begin with, I omitted (some admittedly beautiful) photographs of accordion activity, since an accordion owner never needs to look further than the nearest mirror if they want to see somebody playing an instrument. But that aside, the sky’s the limit! Let’s begin our whirlwind tour of Etsy’s wonderful world of squeezy goods! Maybe you have accordion-lovers on your Christmas card list, but don’t know them well enough to give a bigger-ticket present. (Conversely, maybe you are an accordion-lover with a Christmas card list, and you want everybody to remember it!) You can find lovely block print buttonbox cards or, if your playing is a bit more messily vivacious, a set of splendid Sumi-e cards to benefit 2012’s World Accordion Championship just across the border in Spokane, Washington. Either way, they run you a paltry $2 per card. Now we can graduate to the stocking stuffers! The Accordion Apparel shop evokes the instrument more for atmosphere than to indicate a specialization, but you can’t tell from their swank $1 button! Since I curated the material for this guide back in October, some of the items have SOLD OUT or been removed from circulation. The $2 “Accordion” ‘zine by Jackie “LittleDominoes” Klobucar is among these — and to be fair, we were skeptical about its overall accordion content — though we do know she can squeeze up when she needs to and so it might be worth inquiring whether she can find any copies hidden behind her fridge or perhaps photocopy one more copy for you. As we conduct our monthly squeezebox circle at Spartacus Books, we feel a certain obligation to give local squeezy ‘zinesters the benefit of the doubt. These handsome $3 accordion patches are likewise officially sold out, but due to the way etsy handles inventory, it’s eminently possible that the printmakers are sitting on a new batch they just haven’t gotten around to listing yet, so you can consider looking them up though they won’t be shipping anything new until January — a best-case scenario still has these as belated Christmas presents… or very strange MLK day presents! This one is however best reserved for the winter holiday season — combine your love of old and new technologies with this fetching laser-cut wooden accordion Christmas tree ornament for only $3.75! Yes, it would make a bit more visual sense if the hanging anchor point was on the top of the instrument instead of the bottom, but aren’t we splitting hairs now? If you have a friend who is long on time and manual dexterity but low on cash, you could send this vintage pattern for an accordion-playing doll with bonus monkey! It only costs $5 and arrives instantly, allowing you to use the Internet to celebrate 1930s street performers. Forget the stockings! These presents belong on display!And mostly they play to one of Etsy’s primary hipster strengths, that being: whatever it is you’re interested in, we can mash it up with any kind of animal! Now we return to our final mammal here, the fox. Rather, the … squeeze-fox. The lovely multicoloured print will run you $20, or if your walls are full by now you can also sport the smart design on a t-shirt for $28. While we’re talking shirts, this one is hard to beat for the apocalyptic coming year, regardless of which traditionally-maligned folk instrument you sport. (Definitely I could see the earth cracking open if all four are ever convened in the same place. Caution: do not attempt to replicate the scene depicted on the shirt.) It runs $21.50 but it is after all the best of its kind of garment you’re ever going to find, at least until Threadless offers a Three Wolf Accordion shirt. Rounding the corner — for the steampunk enthusiast on Santa’s extraordinary list, there are two $20 offerings: an accordion/typewriter, and an astounding WWI trench soldier proving that a little mustard gas can’t keep his spirits down as long as he’s got his squeezebox! And something a little classier, a little more upscale, a little more… Warholian: some tasteful serial repetitions of accordion prints, yours for only $45. Back in October there was an amazing item for sale at an incredible price in the triple digits: listed as “conjoined twin accordion player diptych” it consisted of a pair of apparently unrelated oval portraits side by side, each with a different half of an accordion cresting at the bottom of the portrait. 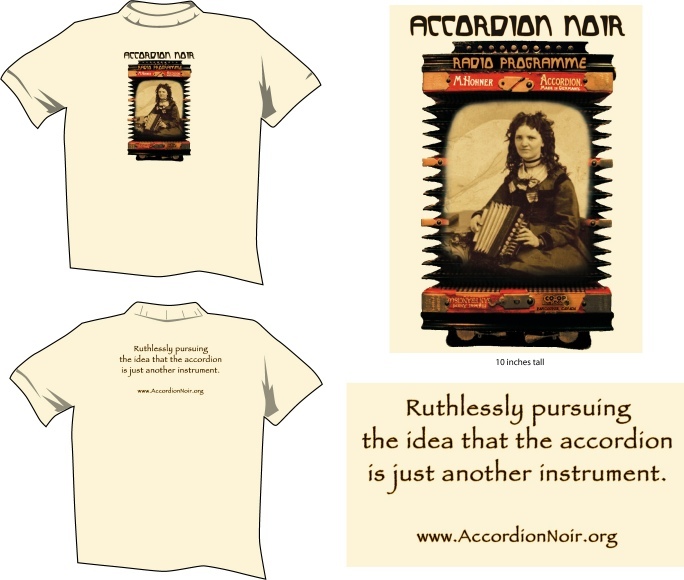 It has disappeared, but it is not alone in its class — perhaps inspired by the Evelyn/Evelyn phenomenon, accordion-sporting conjoined twins have sprouted their share of variants and imitators (or, if you prefer, evil twins.) This print, ominously entitled “Contemplating a solo career”, no longer appears to be for sale — but you can sport its sisters on a ring if you like (or, like we suggested earlier — ask the artist to print up some more!) As always, there is a budget alternative! I know, you are amazed that anyone has been able to generate such a comprehensive list (and from only one website! ), but the most remarkable thing to me is that the shoe-in for this season’s top-selling piece of accordion arthas never been available for sale! I don’t know if the designer is inviting you to print your own copy of it for free, but… he also isn’t offering many alternatives, is he? But wait! There’s more! A couple of Etsy accordion finds that ought to be recategorized as Regretsy finds, for your amusement and dismay. Remember, if you will, long ago at the beginning of this article I discussed dollar thrift-store records? Would you pay somebody $8 to destroy one?This is one record we can guarantee will never play again, except perhaps on Salvador Dali’s gramophone. You could also get your hands on several thrift store bowls for the price of this one, but none of them would… have a hole in the bottom. I got nothing here, folks. As much as we at Accordion Noir reject the 50-year Dark Ages of the accordion in popular music, we have come to agree that there’s something barbaric about actively going around cleansing the historical record of the terminally unhip tunes. Rowan would like to remind everyone that of course the best holiday present you can give someone would be accordion lessons. Thanks for the guest-host-post Rowan! I’ll take one of everything, and I don’t know where I’ll put it. That second octopus is a squid. I might have to note that. The accordion, it’s so crafty, and aesthetically pleasing. Fine details: yes, that’s a squid, not an octopus. Yes, a couple of those are concertinas, not accordions. But… you get the idea.